The range of foods that your pet can eat is much more narrow than the range of foods acceptable to us humans. You’re probably already aware that sharing a chocolate sundae with your dog would be a bad idea, but how can you determine what diet is ideal for your pet? If you are ever unsure of your pet food selection or you think that your pet may have special dietary needs then consulting your veterinarian can be a huge help. Here are some tips for understanding what your pet needs in their diets. Cats are obligate carnivores, meaning that they need certain nutrients only found in meat to survive. This need for a high-protein diet makes them different from us and different from dogs. A cat will thrive on a meat-based diet that is high in protein and low in carbohydrates. A cat’s diet also varies based on age. For example, if a kitten is removed from its mother before it can eat solid food then he or she may need a milk replacer. For most cat owners, however, your cat probably eats dry cat food or canned wet food. Dogs, on the other hand, are omnivorous. This means that they can eat meat, grains and vegetables. A high-quality dog food will have the right balance of these food groups. While dogs can digest all three of these food types, they require them in very specific amounts which can vary depending on your dog’s breed. When feeding your dog you can also choose between dry food or wet food. Rewarding your pet for good behavior with treats is a great idea for motivating and training your animal. That being said, there is such a thing as “too much of a good thing." Keeping your pet’s weight in check can be difficult if you enjoy using treats as a reward. 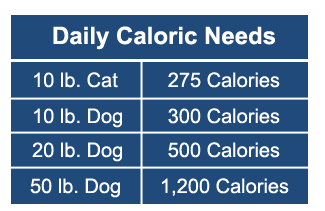 There are low calorie treat options for your pet which are a great option for keeping your pet’s weight under control. 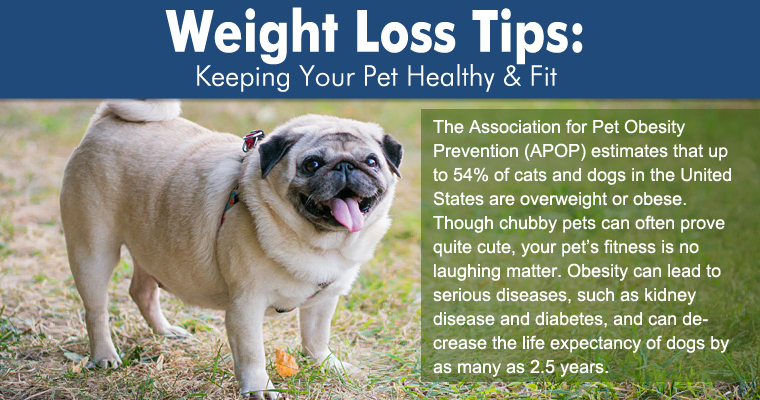 If you suspect that your pet may be overweight, you might want to consider supplements or food that will help manage your pet’s weight. You should always make sure to check with your veterinarian first before drastically altering your pet’s food intake, but selecting a high-fiber food formula that can help ease your pet into a healthier lifestyle. Transitioning to a healthier food formula can also be made easier with a palatable transition supplement. Additionally, you should make sure that you are exercising your pet properly. Keeping your pet active is another important part of keeping him healthy. Just like diet, exercise plays a critical role in maintaining a healthy weight. The calories your pet consumes will be used to create energy if he is active; but with a sedentary lifestyle, these calories might instead be stored by the body as fat. Some of the other health benefits of exercising your pet include stress reduction, healthy digestive function, and behavioral improvements. Dogs need to be mentally stimulated and physically active. Taking your dog for a walk not only allows him to exercise, but it also lets him explore his environment. Plus, it’s an excuse to be active and spend time with your dog! Some people like to ride their bike along side their dog if their dog is particularly speedy. If you decide that is a good option for you and your pup, then you should consider getting a bike leash for your pet. Don’t forget that every dog’s exercise level varies based on its size, breed, and age. You may also need to adjust your regimen based on your dog’s abilities. Cats also need to stay active to maintain a healthy lifestyle. Cats are predators by nature, meaning that their natural instinct is to hunt prey. Keeping your cat active with the help of toys that bring out your cat’s natural instincts is key to keeping your cat on the go. Cats can be difficult to take on walks, but some enjoy short walks on a leash to explore their environment. Cats, like dogs, vary in exercise requirements as they age so you should always adjust your level of play accordingly. We hope these tips help you keep your pet fit in the coming year and that you and your cat or dog have a very happy holiday season!